Windows Presentation Foundation (WPF) allows you to create several types of dialog boxes, including message boxes, common dialog boxes, and custom dialog boxes. This topic discusses each, and the Dialog Box Sample provides matching examples. A message box is a dialog box that can be used to display textual information and to allow users to make decisions with buttons. The following figure shows a message box that displays textual information, asks a question, and provides the user with three buttons to answer the question. To create a message box, you use the MessageBox class. MessageBox lets you configure the message box text, title, icon, and buttons, using code like the following. Dim messageBoxText As String = "Do you want to save changes?" Dim caption As String = "Word Processor"
To show a message box, you call the staticShow method, as demonstrated in the following code. For more information on using message boxes, see MessageBox, MessageBox Sample, and Dialog Box Sample. Although MessageBox may offer a simple dialog box user experience, the advantage of using MessageBox is that is the only type of window that can be shown by applications that run within a partial trust security sandbox (see Security), such as XAML browser applications (XBAPs). Most dialog boxes display and gather more complex data than the result of a message box, including text, selection (check boxes), mutually exclusive selection (radio buttons), and list selection (list boxes, combo boxes, drop-down list boxes). For these, Windows Presentation Foundation (WPF) provides several common dialog boxes and allows you to create your own dialog boxes, although the use of either is limited to applications running with full trust. Windows implements a variety of reusable dialog boxes that are common to all applications, including dialog boxes for opening files, saving files, and printing. Since these dialog boxes are implemented by the operating system, they can be shared among all the applications that run on the operating system, which helps user experience consistency; when users are familiar with the use of an operating system-provided dialog box in one application, they don't need to learn how to use that dialog box in other applications. Because these dialog boxes are available to all applications and because they help provide a consistent user experience, they are known as common dialog boxes. Windows Presentation Foundation (WPF) encapsulates the open file, save file, and print common dialog boxes and exposes them as managed classes for you to use in standalone applications. This topic provides a brief overview of each. 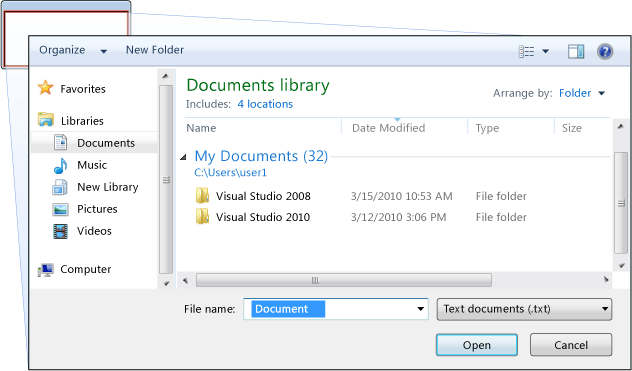 The open file dialog box, shown in the following figure, is used by file opening functionality to retrieve the name of a file to open. The common open file dialog box is implemented as the OpenFileDialog class and is located in the Microsoft.Win32 namespace. The following code shows how to create, configure, and show one, and how to process the result. For more information on the open file dialog box, see Microsoft.Win32.OpenFileDialog. OpenFileDialog can be used to safely retrieve file names by applications running with partial trust (see Security). The common save file dialog box is implemented as the SaveFileDialog class, and is located in the Microsoft.Win32 namespace. The following code shows how to create, configure, and show one, and how to process the result. For more information on the save file dialog box, see Microsoft.Win32.SaveFileDialog. 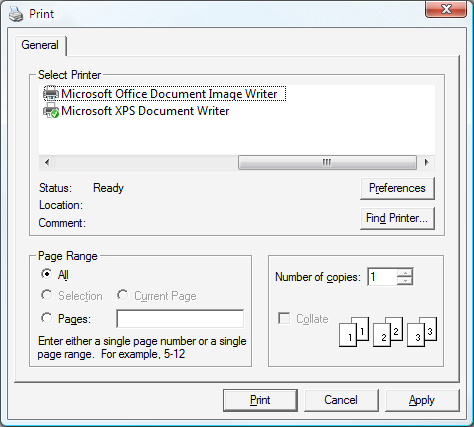 The print dialog box, shown in the following figure, is used by printing functionality to choose and configure the printer that a user would like to print data to. The common print dialog box is implemented as the PrintDialog class, and is located in the System.Windows.Controls namespace. The following code shows how to create, configure, and show one. For more information on the print dialog box, see System.Windows.Controls.PrintDialog. For detailed discussion of printing in WPF, see Printing Overview. While common dialog boxes are useful, and should be used when possible, they do not support the requirements of domain-specific dialog boxes. In these cases, you need to create your own dialog boxes. As we'll see, a dialog box is a window with special behaviors. Window implements those behaviors and, consequently, you use Window to create custom modal and modeless dialog boxes. This topic shows how to use Window to create a typical modal dialog box implementation, using the Margins dialog box as an example (see Dialog Box Sample). 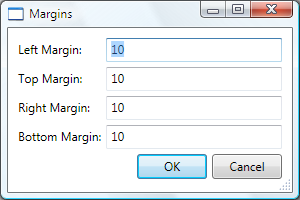 The Margins dialog box is shown in the following figure. The various controls that are required to gather the desired data. Showing an OK button that users click to close the dialog box, return to the function, and continue processing. Showing a Cancel button that users click to close the dialog box and stop the function from further processing. Showing a Close button in the title bar. Showing Minimize, Maximize, and Restore buttons. Showing a System menu to minimize, maximize, restore, and close the dialog box. Opening above and in the center of the window that opened the dialog box. Dialog boxes should be resizable where possible so, to prevent the dialog box from being too small, and to provide the user with a useful default size, you need to set both default and a minimum dimensions respectively. Pressing the ESC key should be configured as a keyboard shortcut that causes the Cancel button to be pressed. This is achieved by setting the IsCancel property of the Cancel button to true. Pressing the ENTER (or RETURN) key should be configured as a keyboard shortcut that causes the OK button to be pressed. This is achieved by setting the IsDefault property of the OK button true. The following code demonstrates this configuration. The user experience for a dialog box also extends into the menu bar of the window that opens the dialog box. When a menu item runs a function that requires user interaction through a dialog box before the function can continue, the menu item for the function will have an ellipsis in its header, as shown here. When a menu item runs a function that displays a dialog box which does not require user interaction, such as an About dialog box, an ellipsis is not required. A dialog box is typically shown as a result of a user selecting a menu item to perform a domain-specific function, such as setting the margins of a document in a word processor. Showing a window as a dialog box is similar to showing a normal window, although it requires additional dialog box-specific configuration. The entire process of instantiating, configuring, and opening a dialog box is shown in the following code. Here, the code is passing default information (the current margins) to the dialog box. It is also setting the Window.Owner property with a reference to the window that is showing the dialog box. In general, you should always set the owner for a dialog box to provide window state-related behaviors that are common to all dialog boxes (see WPF Windows Overview for more information). You must provide an owner to support user interface (UI) automation for dialog boxes (see UI Automation Overview). After the dialog box is configured, it is shown modally by calling the ShowDialog method. From a security perspective, all input should be validated. From a domain-specific perspective, data validation prevents erroneous data from being processed by the code, which could potentially throw exceptions. From a user-experience perspective, a dialog box can help users by showing them which data they have entered is invalid. From a performance perspective, data validation in a multi-tier application can reduce the number of round trips between the client and the application tiers, particularly when the application is composed of Web services or server-based databases. To validate a bound control in WPF, you need to define a validation rule and associate it with the binding. A validation rule is a custom class that derives from ValidationRule. The following example shows a validation rule, MarginValidationRule, which checks that a bound value is a Double and is within a specified range. In this code, the validation logic of a validation rule is implemented by overriding the Validate method, which validates the data and returns an appropriate ValidationResult. To associate the validation rule with the bound control, you use the following markup. Once the validation rule is associated, WPF will automatically apply it when data is entered into the bound control. When a control contains invalid data, WPF will display a red border around the invalid control, as shown in the following figure. 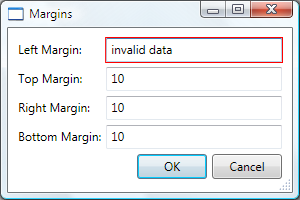 WPF does not restrict a user to the invalid control until they have entered valid data. This is good behavior for a dialog box; a user should be able to freely navigate the controls in a dialog box whether or not data is valid. However, this means a user can enter invalid data and press the OK button. For this reason, your code also needs to validate all controls in a dialog box when the OK button is pressed by handling the Click event. // Check if dependency object is valid.
' Check if dependency object was passed and if dependency object is valid. This code enumerates all dependency objects on a window and, if any are invalid (as returned by GetHasError, the invalid control gets the focus, the IsValid method returns false, and the window is considered invalid. Once a dialog box is valid, it can safely close and return. As part of the return process, it needs to return a result to the calling function. Opening a dialog box using ShowDialog is fundamentally like calling a method: the code that opened the dialog box using ShowDialog waits until ShowDialog returns. When ShowDialog returns, the code that called it needs to decide whether to continue processing or stop processing, based on whether the user pressed the OK button or the Cancel button. To facilitate this decision, the dialog box needs to return the user's choice as a Boolean value that is returned from the ShowDialog method. When the OK button is clicked, ShowDialog should return true. This is achieved by setting the DialogResult property of the dialog box when the OK button is clicked. Note that setting the DialogResult property also causes the window to close automatically, which alleviates the need to explicitly call Close. When the Cancel button is clicked, ShowDialog should return false, which also requires setting the DialogResult property. When a button's IsCancel property is set to true and the user presses either the Cancel button or the ESC key, DialogResult is automatically set to false. The following markup has the same effect as the preceding code, without the need to handle the Click event. A dialog box automatically returns false when a user presses the Close button in the title bar or chooses the Close menu item from the System menu. When DialogResult is set by a dialog box, the function that opened it can get the dialog box result by inspecting the DialogResult property when ShowDialog returns. If the dialog result is true, the function uses that as a cue to retrieve and process the data provided by the user. After ShowDialog has returned, a dialog box cannot be reopened. Instead, you need to create a new instance. If the dialog result is false, the function should end processing appropriately. A modeless dialog box, such as the Find Dialog Box shown in the following figure, has the same fundamental appearance as the modal dialog box. However, the behavior is slightly different, as described in the following sections. A modeless dialog box is opened by calling the Show method. Unlike ShowDialog, Show returns immediately. Consequently, the calling window cannot tell when the modeless dialog box is closed and, therefore, does not know when to check for a dialog box result or get data from the dialog box for further processing. Instead, the dialog box needs to create an alternative way to return data to the calling window for processing. In this example, the FindDialogBox may return one or more find results to the main window, depending on the text being searched for without any specific frequency. As with a modal dialog box, a modeless dialog box can return results using properties. However, the window that owns the dialog box needs to know when to check those properties. One way to enable this is for the dialog box to implement an event that is raised whenever text is found. FindDialogBox implements the TextFoundEvent for this purpose, which first requires a delegate. 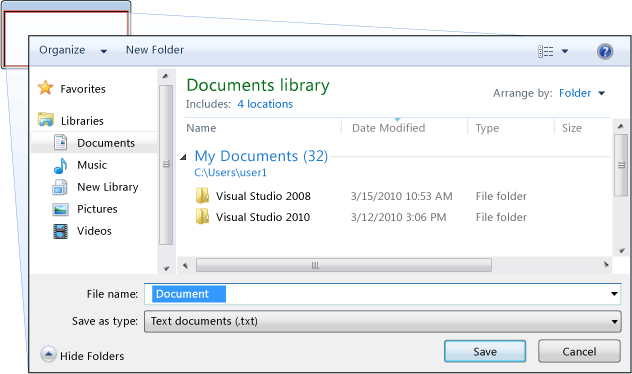 Using the TextFoundEventHandler delegate, FindDialogBox implements the TextFoundEvent. Consequently, Find can raise the event when a search result is found. The owner window then needs to register with and handle this event. Clicking the Close button in the title bar. Choosing Close from the System menu. Alternatively, your code can call Close when the Close button is clicked.